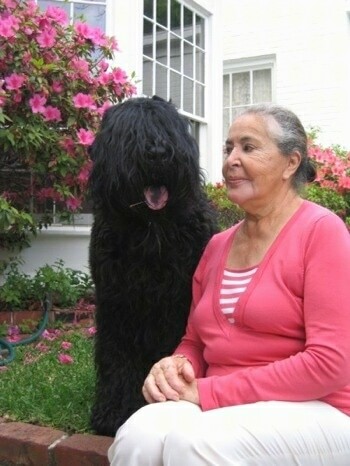 Black Russian Terriers are larger than mid-size. This rare Russian breed is robust and strong with a good nervous system. It is large, powerful, stable and alert. The block-shaped head should be powerfully built with a broad skull and a long head. The mustache and beard add to the squaring off of the muzzle. The stop should be well-defined but not pronounced. The nose is large, fully pigmented and black in color. The lips are full, rounded and black at the ridges and the jaws are large and powerful. The mouth should be meaty and if it is not, it is a major default in the show ring. The teeth should meet in a scissors bite. The dark eyes are medium-sized and set apart. Rims should be black and almond-shaped. The ears are triangular in shape with a rounded apex and pendulous. Cropped ears are not acceptable. The length of the ear should reach the outside corner of the eyelids. The ears are set rather high. The neck should be thick, muscular and powerful. The length of the body should be in direct proportion to the height at the withers, giving it a square look. The withers rise over the backline and the croup is lightly descending to a high-set tail. When the tail is docked, there are 3 to 5 vertebrae remaining. An undocked tail is not to be penalized by the AKC. Note: docking tails is illegal in most parts of Europe. There should not be pendulous or excessive dewlap. The very large, bear-like feet have tough, black, thick pads and the nails are large and dark in color. The body is well proportioned with the trunk outline lying within a rectangle. Length of the body should be in direct proportion to the height at the withers. Topline should be level but not appearing flat or straight. The forelegs should be set straight and well-boned. Shoulders should be large, muscular and well developed with blades broad and sloping. Elbows should be neither in nor out. The legs should be covered with 2 to 4 inches of coarse hair. The feet are very large and fully covered with hair. The hindquarters are well-boned and muscular with a high degree of angulation. The hocks are large and developed for spring and drive. The legs and feet are well covered. The appearance is full. The legs should be parallel to each other. 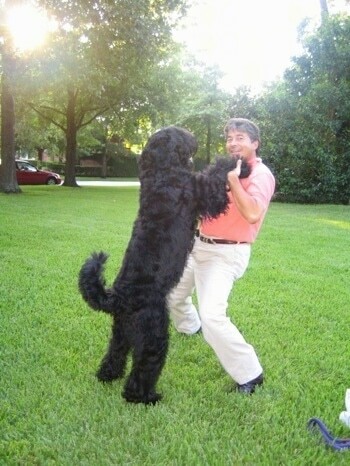 The Black Russian Terrier has a strong, powerful and well-coordinated gait. They appear to be light on their feet. The tail is cropped and set high. The waterproof coat should be black. White or brown markings are disqualifying. The appearance of individual grey hairs within the coat is expected. The coat may appear full or hand stripped. The texture of the coat should be somewhat coarse—the extent depending on whether it is full or hand stripped. The beard and muzzle should never be touched. 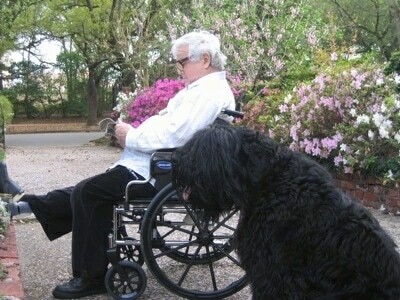 Black Russian Terriers are brave and very observant. Suspicious of strangers, they have a strong protective instinct that will appear at the age of one and a half to two years. 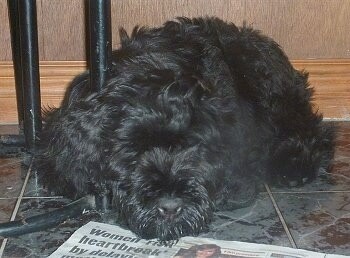 Growing puppies should be treated lovingly but firmly, to steer them in the right direction. Puppies are sensitive, playful, adaptive and quick to learn. They are inquisitive and will get into everything. Even as an adult they are enthusiastic about children and love to play with them. This breed seeks intense contact with humans and animals. BRTs have a strong and balanced temperament. They avoid fighting with other dogs, although males cannot live with other big dominant dogs if the owners are not 100% alpha over both of them. This breed can easily live with non-dominant or small dogs, cats, horses, rabbits etc. They are easy to housebreak and should easily accept the leash. BRTs enjoy their training sessions and love to please their master. This breed only barks when they feel it is necessary. Quick to act, they are always ready to protect their owner and house. 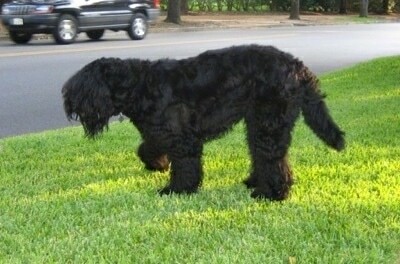 Black Russian Terriers are "late bloomers" and take a long time to fully mature. If the dog is given firm leadership as a puppy and the owners remain consistent through adulthood, dominance is no problem. You should only share the bed, couch and table with your puppy if you are willing to do that one year later as well. No matter how sweet and charming the puppy is, remember that within a year this will be a strong and powerful dog. 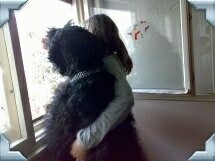 Black Russian Terriers are easy to have in the house with a little care. They should not live in a kennel outside because such dogs get too little attention and stimulation. 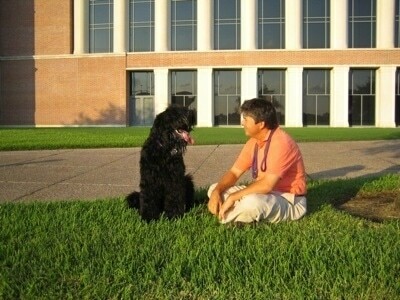 Daily mental and physical exercise is important in order to release this dog’s energy. If you allow the energy to build up inside them you will run into behavior issues. The dog should never walk in front of the human while on a lead, but should be beside or behind them in order to reinforce the dog’s place among the humans. In a dog’s mind, pack leader always goes first. Constant leadership and close contact with the family brings out the best qualities of this breed. If this kind of dog is kenneled outside, away from its family with no leadership, it will not learn how to suitably protect things and may well someday protect its kennel against its owner! With a tolerance of 1.3 inches (3 cm); more if the dog is well proportioned. 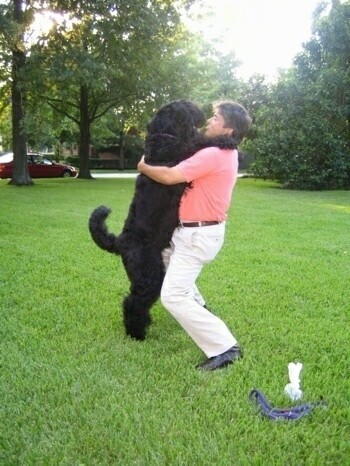 Male dogs are bigger and more massive than females. Prone to hip and elbow dysplasia. X-raying the dogs is not common to the Russian breeders, so it's up to the breeders outside Russia to overcome this problem by targeted selection. If the ears are not well cared for they have a tendency to get otitis. The weatherproof coat consists of hard, wiry, tight, close-lying, wavy hair which is about 1.5" - 4" (4 -10 cm) long. The BRT sports eyebrows and a beard. The upper-neck portion and withers suggest a mane. The undercoat is tight and well developed. Regular trimming 2-3 times a year is needed. Stripping is needed only if the coat is soft. Brush the BRT at least once a week. It is important to remove hairs from ear ducts and cut the hairs under the paws. The BRT sheds very little if it is regularly brushed. In the Forties, the army-controlled kennel "Red Star" began to breed a dog for its own needs. They used a program developed by Soviet breeder-specialists and created a new breed especially suited for their special duties. The goal was a massive, robust, high-spirited all-round dog, always willing to work and able to withstand the enormous, climatic differences in the country. 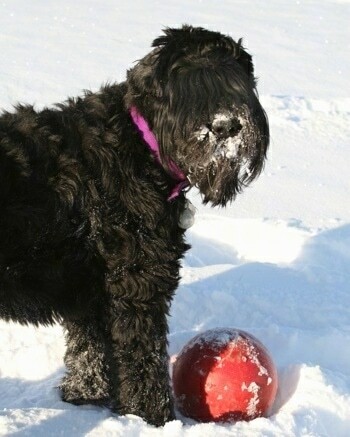 The breeders were the Giant Schnauzers, Rottweilers and Airedale breeds, and the Russian Water Dog. 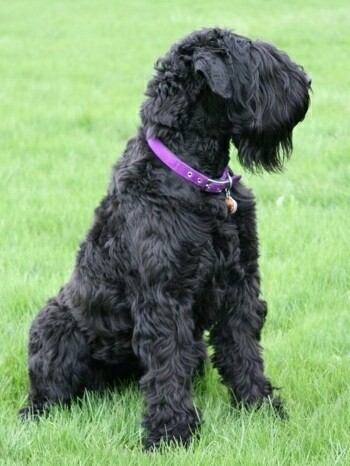 More breeds were included; in all approximately twenty breeds were involved in the creation of the Black Russian Terrier. Only the best dogs were bred. Soon they had a dog stable in character and temperament, but not in type. At that time, only character and temperament counted. Several years later, Russian "DOSAAF" Breeders (DOSAAF is a paramilitary organization) bought dogs from the Red Star kennel. They started to standardize the look of the breed without neglecting the good qualities. 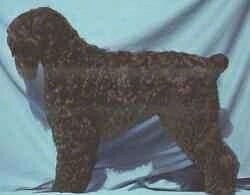 In May 1984 the breed was recognized by the FCI with Standard #327 "Black Russian Terrier." 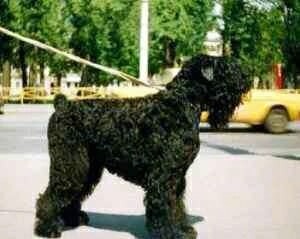 The Black Russian Terrier is to the Red Army what the Malinois is to the French Army. 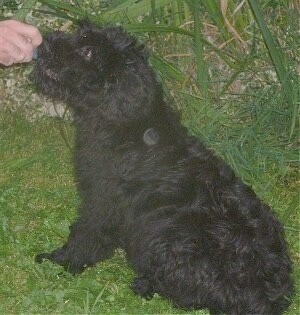 The Black Russian Terrier has all the ability of the German Shepherd Dog without the undue aggression. 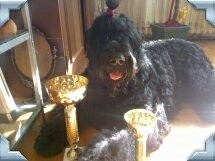 On July 1, 2004, the Black Russian Terrier was admitted to full membership in the AKC Working Group. 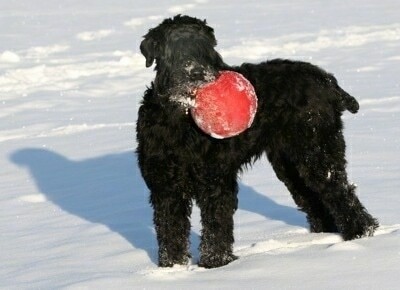 The FCI calls the breed the Russian Black Terrier. Boris (Bojai Crook) at about 5 years old—while Boris is not certified he works as a therapy dog for his owner's parents. His owner is considering getting him certified.